House of Anansi Press, 9781487002121, 128pp. The world is facing the worst humanitarian crisis since the Second World War. Over 300,000 are dead in Syria, and one and half million are either injured or disabled. Four and a half million people are trying to flee the country. And Syria is just one of a growing number of failed or failing states in the Middle East and North Africa. 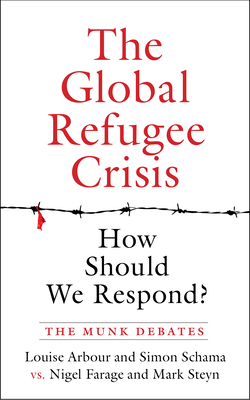 How should developed nations respond to human suffering on this mass scale? Do the prosperous societies of the West, including Canada and the U.S., have a moral imperative to assist as many refugees as they reasonably and responsibly can? Or, is this a time for vigilance and restraint in the face of a wave of mass migration that risks upending the tolerance and openness of the West? The eighteenth semi-annual Munk Debate, which was held on April 1, 2016, pits former UN High Commissioner for Human Rights Louise Arbour and leading historian Simon Schama against former leader of the UK Independence Party Nigel Farage and bestselling author Mark Steyn to debate the West's response to the global refugee crisis. Louise Arbour's career of public service includes sitting on the Supreme Court of Canada from 1999 to 2004, acting as the Chief Prosecutor for the International Criminal Tribunals for the former Yugoslavia and Rwanda, and serving as the United Nations High Commissioner for Human Rights. From 2009 to 2014 she was CEO of the renowned International Crisis Group. Arbour is a Companion of the Order of Canada and the recipient of twenty-seven honorary degrees. She is currently a jurist in residence at Borden Ladner Gervais LLP. Simon Schama is an internationally acclaimed historian, political commentator, and art critic. He is University Professor of Art History and History at Columbia University, and the award-winning author of seventeen books, including Rough Crossings and The Story of the Jews. He is also the writer-presenter of fifty documentaries of art, history, and literature for BBC2 and has written and presented more than thirty television documentaries for PBS, the BBC, and the History Channel. He is currently working on Civilizations, a television history of world art. Nigel Farage was the leader and founding member of the UK Independence Party (UKIP). In the 2015 UK general election, the UK Independence Party came in third with thirteen percent of the popular vote or 3.8 ballots cast. Mr. Farage was recently named -Briton of the Year- by The Times and ranked first in the Daily Telegraph's Top 100 most influential right-wing politicians. Since 1999, he has been a Member of the European Parliament for South East England. Mark Steyn is an internationally acclaimed author, writer, journalist, and conservative political commentator. He has written five books, including America Alone: The End of the World As We Know It, which was a New York Times bestseller. His commentaries on politics, arts, and culture appear regularly in the National Post, The Wall Street Journal, and The Atlantic. He guest hosts Rush Limbaugh's top-rated talk radio program and Hannity on Fox News television.